essence of his art form was visible in such subtle movements that they were almost invisible and appeared magical to the uninitiated. Hello, Sensei. What is the difference between Budo and Bujutsu? Some teachers refer to zen in their teaching of Aikido, other to Shinto. What is your opinion on this subject? All this is true. The Japanese culture was forged in the dojos. One cannot limit or divide it. Each thing finds its place in a harmonious whole. When someone dies, a monk comes for the funeral ceremony; marriage is carried out according to the Shinto tradition….finally today more and more young people are getting married in churches (laughs). It is often something that is not understood by Westerners but in Japan, this is something very natural. To be born Japanese is to be exposed to and surrounded by a whole that includes both Zen and Shinto and where nothing is exclusive. If one does not know the spiritual environment of budo, one learns only combat techniques. This is why I think that it is easier to understand Aikido if one studies the spirit behind Japanese culture. Is it, therefore, necessary according to you to know the Japanese culture in order to understand Aikido? Did you ever spend time with Deshimaru Sensei? I met him through Nakazono Sensei and the Macrobiotic circle at the time. Deshimaru Sensei was a friend of Osawa Sensei and he was really a very unique character. When he arrived in France a meeting was organized for people interested in Zen. When asked what zazen was, he sat on the desk and did zazen. After that, he left! (laughs). You teach in a number of countries from France to Japan, from the USA to North Africa. Do you change your style of teaching depending on where you are? Each country has its own culture but all students try to practice Aikido, which is one and the same wherever one goes. On my part, I try to present things in the most comprehensible manner for each person. There are not that many differences. I simply try to answer the questions that practitioners have and to see what needs correcting. Depending on the place the latter varies, but the essence of Aikido remains the same. Of course it is sometimes necessary to explain certain cultural details. For example, in Muslim countries, some students are reluctant to bow in seiza, so I explain to them that in Japan it is nothing more than a form of greeting, a sign of respect and gratitude. Recently, during a course for seniors (higher than 4th Dan), someone stood up while I gave an explanation in sitting position. In Japan, one would take this as a challenge. In the West, when a woman or an important person arrives, one stands up. The most important people are those who are seated. In Japan, it is the opposite: the important people are those who are standing. These are small things but their meanings are contrary and can give the impression that the person in front of you wants to cause offense even though their intentions are the opposite. If these intentions are not understood, they can be easily misunderstood and lead to an incident. These types of misunderstandings disappear when things are explained. That is why I think it is important to know the culture of others. Today, Japanese youth seems disinterested in the practice of the traditional ways. What do you think? In my time, the practice of the martial arts was mandatory in school and represented the bulk of our sports practice as gym classes were virtually non-existent. A qualified sports teacher who could spin around a pole would impress everyone at the school (laughs). The girls practiced Naginata and the boys Judo and Kendo. It was natural for us. Nowadays, young people do not know pre-war Japan and its spirit. They do not know people like General Nogi and the values that he represents. The ways that were created to develop man and maintain these traditional values are today obsolete in their eyes. Moreover, the reigisaho (etiquette) that is at the heart of these ways is progressively losing its importance and nowadays, the practice of these disciplines brings one no more than the practice of boxing. The arts of Kendo and Judo are often pre-occupied only with competitions and have become sports. That is true. In these types of sports, considered to be without rules, one is allowed to hit like this or that; there is no real danger. The notion of life or death is totally absent from these disciplines. Previously, a samurai who fought even if only with a bokken was at risk of death. Their shugyo, or ‘training’, accustomed them to living at the border between life and death and that made all the difference. Today athletes are willing to do anything, even to cheat and dope themselves to win a medal. The youth of today does not practice budo and does not even know what it is. The people who created the budo have long since left us and I wonder sometimes if it is still possible to save these ways. Fortunately there exist people today such as Kuroda Sensei here and there in Japan who maintain this heritage. It is, without doubt, thanks to these people that these ways survive. When Japan entered the Meiji period after the bakumatsu, budo almost disappeared for a few decades. And at this time there weren’t any videos and very little written texts. In addition, the texts that did exist were incomprehensible if an explanation wasn’t provided. In your opinion, what are the strengths and weaknesses of french Aikido? That is a difficult question. France is a country with a very rich culture. The French love Aikido and they have an artistic soul! But they like to understand with their heads. They know how to explain things that I cannot express. Succeeding in putting that into practice is another thing (laughs). In Aikido, is weapons training important? It was O’Sensei who created Aikido. And every time he demonstrated Aikido, he used weapons. It is not for us, his disciples and students, to decide whether or not it is necessary to practice weapons. It is no doubt a French trait to question everything. In Japan, you would immediately be called a fool if you questioned this fact (laughs). Is the practice of weapons thus essential in Aikido? Is it necessary to practice in suwari waza? In my opinion, yes. The constraints of the kneeling position allow one to better understand and learn how to use one’s body. This, in turn, enables a better practice of tachi waza. Good work on the knees is always the source of excellent standing work. However, a person who works well in standing position cannot do well on their knees without having trained at it. Did O’Sensei use the terms Aikiken or Aikijo? He did not use these specific words. He simply took a weapon and practiced with it. Occasionally he used the expression shochikubai no ken (the sword of the pine, bamboo and plum trees). The pine tree, matsu, bamboo, take and the plum tree, ume, in Japan are symbols of prosperity and happiness. The pine symbolizes longevity and endurance because it stays green throughout the year. Its leaves are separated into two like the In (yin) and Yo (yang) but are united and represent also the concept of musubi (harmony, connection). The bamboo symbolises both force and suppleness and grows full of energy up into the sky. Regarding the plum tree, it flowers in the most hostile and cold of seasons and represents the difficulties that one succeeds in overcoming. O’Sensei did not provide detailed technical explanations but he did exhibit these concepts in his practice with the sword work. At the time, we did not understand anything and just tried to mimic his actions, trying to see what movements he made, what he did with his hands. We understood even less when he was facing us in a technique because we were absorbed in his energy and had the feeling of being absorbed! When watching, at times, it looked like a hoax to us. At the very instant that you had that thought O’Sensei would turn around and stare at you. Perhaps it was just because we had a guilty air about us when he turned his head (laughs). But he was very good at hearing everything and knowing what was going on around him. O’Sensei would tell us to attack and we were suddenly hit or cut. Even when watching with all of our attention, we did not understand how he could have performed the technique that he had. We tried but always found ourselves cut! When you study with people who do not understand, it is natural that you do not understand either (laughs). I am truly sorry for that. What was the shochikubai no ken? Shochikubai no ken is not a specific form. The movements of O’Sensei varied according to his mood. Shochikubai is a symbol, not a particular sequence. The Western mentality has a tendency to want to define everything. Yet when you seek to define something, you realize that it is made of many things. These things themselves break up into multiple things. And so on until finally one, I can imagine, arrives at the smallest parts. But then you realize that you have lost the view of the whole and that you absolutely do not know the essential thing, the totality. What are the origins of the weapons techniques in Aikido? anything interesting that is within reach. One must keep one’s eyes wide open and experiment with what appears interesting, keeping the good and rejecting the bad. This is how one must live. This was how we were taught by O’Sensei and in a sense, we were encouraged to study, search and understand by ourselves. Was it O’Sensei who created the katas such as Ichi no Tachi? These are creations of Saito Sensei. O’Sensei showed the shochikubai ken but did not teach katas as such. Hirokazu Kobayashi Sensei who lived in Osaka had a lot of experience with weapons work because he was an advanced practitioner of Kendo. He came from a wealthy family and was often otomo (companion) to the founder in his travels. I would accompany O’Sensei from Tokyo and Kobayashi Sensei would meet us in Osaka. He would take us to excellent restaurants and I was really happy (laughs). He told me that he had often helped Saito Sensei to correct what he had seen in the founders’ movements. At the time O’Sensei taught through practice. We attacked him and he hit us. Suddenly we would receive a blow, and he would tell us that it was obvious if we did what we were doing. It was painful but effective. 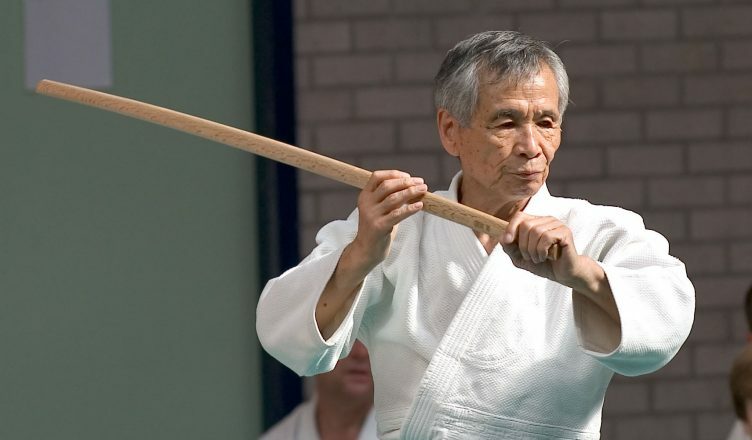 Kobayashi Sensei had lots of experience with the sword and was useful to many students including Saito Sensei. Saito Sensei wished to compile all the weapons techniques. He helped O’Sensei – who had a house in Iwama – a lot. Saito was at the same time a train driver and this must have been very difficult for him. We were not working and devoted ourselves solely to training; our situation was much easier than his. It was a difficult time for many people. Did O’Sensei not teach paired katas, whether at Iwama or Hombu dojo? somebody, explain hiteomi, things like that. But he never followed a pedagogy in a scholarly sense with established steps. We would wonder why he didn’t explain things (laughs). We told ourselves that without an explanation it was normal that we couldn’t do it. But he saw things with a much broader perspective. We were like kindergarten children listening to an academic discussion and telling ourselves that we didn’t entirely understand what was being said. With time we came to understand certain things. When you practice you never clash with the weapons. Did O’Sensei practice like this also? One can see it in the films. O’Sensei never clashed with weapons. If the weapons clash, it means that there is a block and one never blocks because this signifies that one has been cut. What type of bokken did O’Sensei use? Saito Sensei invented the thick bokken which carries the name Iwama. O’Sensei generally used a magnificent thinner bokken made of kokutan (ebony) in the Yagyu style. I was hoping that he would give it to me one day until I noticed that he had already given it to someone else! He was very generous and gave things away easily. O’Sensei probably used something else when he was younger but when I was uchi-deshi he generally used light bokkens only. He used whatever was close at hand but his favorite bokken was long and thin, of the yagyu shinkage or jiki shinkage type. Except for tanren, where he used a heavy and thick bokken. Tada Sensei used it easily with one arm! There is a famous photo of O’Sensei with a row of bokken behind him. It was like this when I became uchi-deshi. We would use these ten or so available weapons. Are there common points between the Jo of Aikido and of Jodo? How should one strike with the jo? The work of the jo in Aikido comes from the spear. Initially, before the birth of Aikido, it was for his skill with the spear that O’Sensei was known and invited to Tokyo. I never saw him do it but it is said that he was capable of moving 60kg bags of rice with the tip of his spear. In his youth, he used long spears but I mainly saw him work with teyari. O’Sensei generally made the jo slide, which was a very different way of hitting from Jodo. When I hit, I turn my hands in an opposite direction to one another. Must one practice the jo on one side only or alternate the guards between left and right? Both sides are possible. However, generally, the guard with the jo is the opposite of that with the ken. This allows us to develop our bodies in a balanced and harmonious way. Are the swords of Aikido, Kendo and iaido different? They are technically different but similar in their essence. Unfortunately today, in Kendo, the sword no longer cuts. In competitions, it is sufficient to touch. Kendo has in a way followed the evolution of Western fencing where one can win by touching nonvital points that would expose one to a mortal cut in true combat. These disciplines have become games where one seeks only to be the first to touch the opponent. Kendo is the way that seeks most to preserve the tradition but competition has made it lose the essence of budo. These disciplines have been lost by practitioners’ desire to win at all costs. Did O’Sensei use other weapons other than the jo and bokken? He used the spear, the yari, for a long time. There was actually a long spear in the dojo that he used to use a lot. It seems that he initially became famous for his mastery of this weapon before he became known for his empty hand techniques. He had also learned how to handle the juken, the bayonette, in the army. In fact, you can see him do a demonstration of it in a film from the 30’s. Did O’Sensei also practice tanto dori? I never saw him do it. Back in the day the Yakuza always fought with a knife. One day a fighter asked what one could do against these types of attacks. It was the sempais who developed this work. It was very spectacular for the demonstrations. No Replies to "Nobuyoshi Tamura; The Eagle of Aikido / 1"